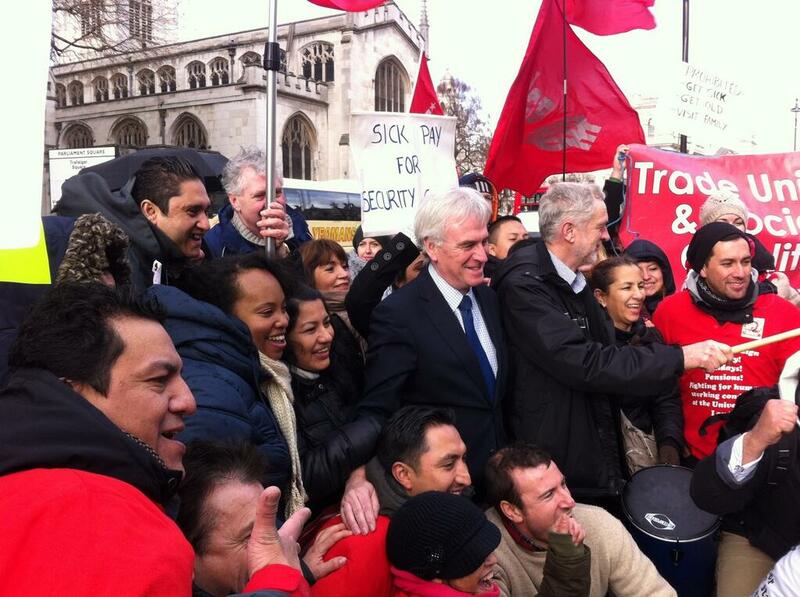 John McDonnell MP and Jeremy Corbyn MP with IWGB strikers at Westminster in January 2014. This appeal is on behalf of the University of London branch of the Independent Workers’ Union of Great Britain (IWGB), an independent trade union representing the poorest workers in London. Our success has always come from the support of a network of friends, families and volunteers. As part of plans to take our campaigning to the next level we are initiating the IWGB Community, and we would like you to join! The IWGB organizes the UK’s most hyper-exploited workers, most of whom are women and migrants. These are the people that clean the toilets of the city, sweep its floors and carry out the portering. They travel on the early-morning buses or trains, when most of London is still in bed, and spend their days doing shifts for two or three different employers. To most people they are one thing: invisible. 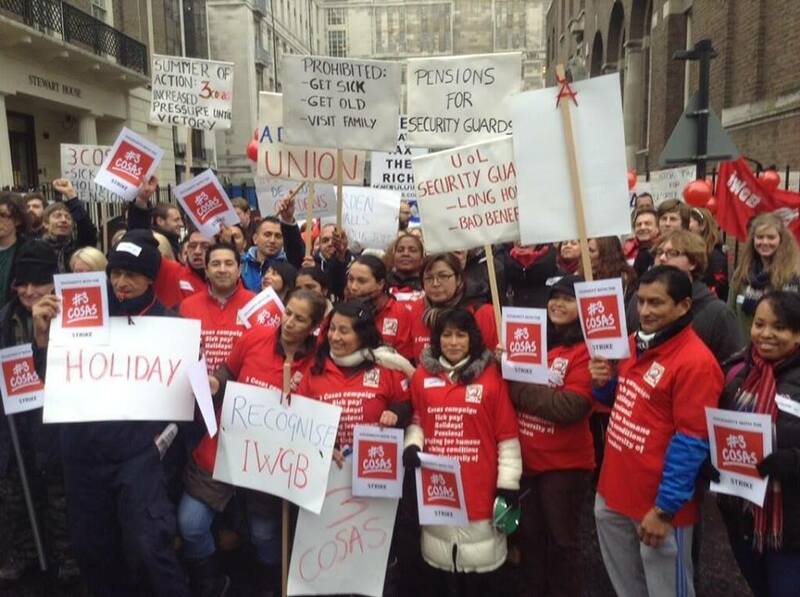 IWGB 3 Cosas strike at Senate House, November 2013. Over the past 12 months alone our campaigns have led to cleaners and other low-paid workers winning improved sick pay, holidays and pensions and achieving the London Living Wage (now £9.40). Just recently we have secured these improvements for workers at the London School of Hygiene and Tropical Medicine; and we have also won the London Living Wage at the Royal College of Music and the Royal College of Art. On top of this, we provide free language classes; organize social events, provide free employment law advice in our workers advice centre, support members in disciplinaries, grievances and at employment tribunals. More important than the campaign victories, the democratic, worker-led initiatives have given workers respect and dignity. They are beginning to be treated like human-beings. With next to no resources we have achieved impressive and life-changing results. We now need financial support to take our struggle to the next stage.We are asking you to become a member of our community, the University of London IWGB Community. 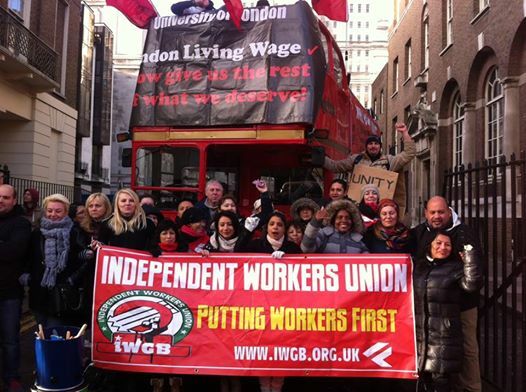 The IWGB Battle Bus – day 2 of the January 2014 strike! As a member of the University of London IWGB Community you will receive a regular newsletter about the activities of the union, you will be invited both to our parties and our protests, and, most importantly, you will be key to the development and success of the union at a critical time. We ask that you pay a small monthly sum to help us achieve our aims. How will your contribution be spent? To help with the funding of the IWGB Legal Department. We have won funding for the formation of a Legal Department, however we will need more in order to pay for a legal department coordinator. To pay for campaign organizers who will help run the campaigns that our members depend upon. To pay for the rent of our small office in which we hold employment rights talks’ and our members meet. To support strike action taken by low-paid members. We hope that you are able to help our union grow and support some of London’s most vulnerable workers achieve dignity and respect. We would be delighted to welcome you into our community – please download the donation form here.